It's always good to hear from you guys. This year I asked you to provide me with your aviation highlight of 2008. I was quite pleased with the responses I got. Here are a few. Another year has gone by and there is little more to be done on my Q2. 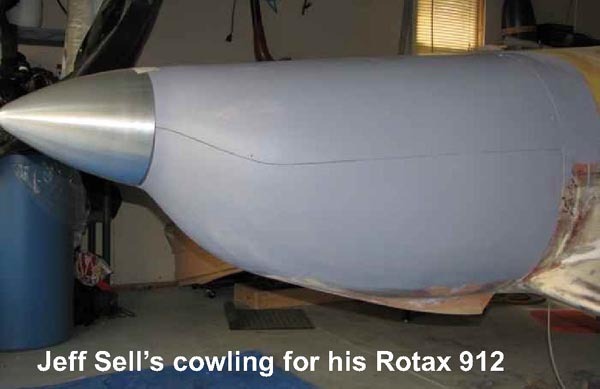 In September I wheeled the fuselage out of the garage and attached the tail . Boy! that looks and feels good! Then the big moment.....the first engine runup for the Revmaster with the prop attached! Well...it went great!.....Heard from some neighbors that someone had called 911 as they thought from the roaring sound there had been a crash near by! I was surprised to notice the cyl head temperature stayed well in the green, so my engine baffles were keeping things "cool man"! I have probes on each of the 4 cylinders and they were nice and even. I have to do some carb adjusting, but I expected that. Too bad I am not near an airstrip, as I would sure like to take her for a spin on a runway. Notice the landing lights.....There was ample room in the nose cowl to mount a pair of 35 watt Halogen lights. I had to make the lenses from some plexiglass and shape them in a toaster oven. They give a sea of light. Its nice to be seen in the circuit even though it is not meant to be for night flying. In October we had some heavy rain and freezing weather. I still have to hook up some antennae and plan to install a beacon. So, off came the tail. I happened to look in the back of the tail and noticed a BIG chunk of ice!!! Would that ever be a killer! After I had disassembled everything, I drilled a drain hole in the aft section of the tail, just ahead of the bulkhead and secured a rubber grommet in the hole. Much progress has been made in 2008. My O-200 sits ready to mount complete with C85 pistons and Lightspeed ignition from Dave Chalmers' Q. One mag and one lightspeed. I've completed the retrofit firewall for the O-200 and have sold off the Revmaster. The reflexor, speed brake and flight controls are nearly complete as is all but the belly section which needs micro and finish. The tail section has been converted back from TriQ to conventional configuration. (WOW! I didn't know anyone would ever do this!) I have great hopes that 09 will be the year that it flies. The Q-list has been a very valuable tool in my building and although I don't have much to contribute, I'm there in the background lurking and learning about the little details that are so very important. My dining room table is where I'm working now on the instrument panel. All components are on hand except for brake discs and CHT gauge. Thanks for all that you do along with the other "cardinals" of the Q group. Your experience and willingness to help are greatly appreciated. Have a happy and healthy new year and I'm looking forward to seeing you guys in the sky this year. Best wishes for the upcoming 2009. Just renewed my electronic .pdf Q-Talk subscription by Paypal, hopefully you'll receive it in order. I like the .pdf edition -the color photos, the speed of delivery and if I need a paper copy later, I can print one out for myself. Well, the bottom came out of the oil industry in Calgary and layoffs are imminent. On the other hand prices of many things are more affordable, incl. gasoline. Something similar happened back in 1982-83 when the world oil prices collapsed, just after I bought my Q2 kit. But this time it involves more industries worldwide. I am working hard toward seeing the Q2 project through to completion but have to do one thing at a time, first things first. Thank you for your excellent work as an Editor, the Q-Talk is a glue that holds the whole organization together. Just to let you know, there was a bit more progress on my slow build of my Q-1. I actually got to sit in the fuselage a few months ago. This is a major milestone for me. I hope to get more done in this new year. Thanks for doing the hard work to keep us Q guys in touch and aware of issues! the panel, scrounged a Grand Rapids Technologies EIS today which gives us a big boost. The Terra Com and Nav are just not going to make the cut, hardly worth sending them out for repairs. We are planning to add copilot rudder pedals. 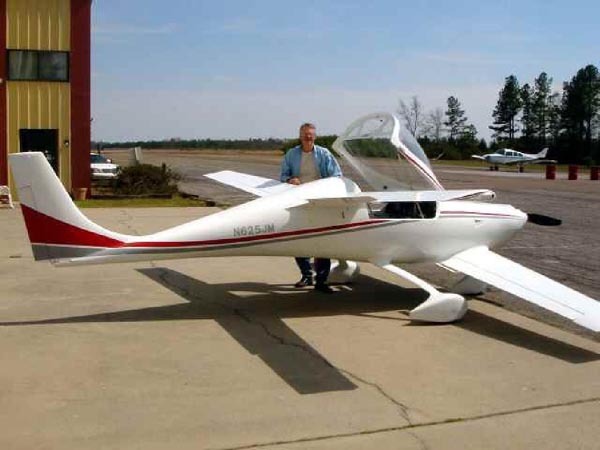 My big goal for 2008 was to earn my light sport CFI. I did the spin training in a C150, then began training in a Sport Cruiser. Winter winds and a very busy instructor made for slow progress until summer when I began supplementing my training by flying with another private pilot who played the role of a student. I took the oral exam and was surprised to find it fun. The flight exam was postponed due to weather. What a feeling of accomplishment to earn the new ticket! I am still jazzed and working on my plane since September. Keep me posted on next year's FOD. I will have a very interesting project for everyone to participate in. I will put an article together for the newsletter to generate interest a little later in the year, and then do a follow-up at the end of the year after the fly-in season. Hello Doug; Season's Greetings, and thank you for all the effort you have put into the Q Newsletter. You have brought it to a completely unprecedented high! The cold Iowa weather is great time for doing some modification to the Tri-Q. Here is what Ive been up to. First I had to pull the cylinders to replace the cylinder seals as I have been fighting oil leaks. I figured as long as it was apart I would drop in a set of the NFC pistons (9 to 1 compression ratio) to get a little extra horsepower. After that I decided it was time to work on better cooling and look for a way to decrease drag, so I got Jerry Marstall to loan me his closed plenum mold. Now it was time for a Earnest Martin cowling. He does great work and this cowling fits great to the closed plenum I have built. Now it was time for a new exhaust that fits the new cowling. Then I reworked the intake box to fit under the new cowling. All these mods are coming along fine and I should be ready for paint by spring. I also replaced my old canopy with a new smoked one from Todd's Canopy. It's amazing how one modification turns into many as we look for the need for speed. which included: New Bob Malechek O-200, two new props, new paint job, Earnest Martin cowling and wheel pants, new instrument panel to include Dynon D100, new leather upholstery, new electrical system, new fuel system to include aux tank, new tires, and a bunch of new gremlins. The last several months I have been on a gremlin hunt. I think I have bagged most of them now. Hope to have it at the Spring Fling. I'm making progress, on Q-2 serial #2743. It was purchased without an engine in 2005. 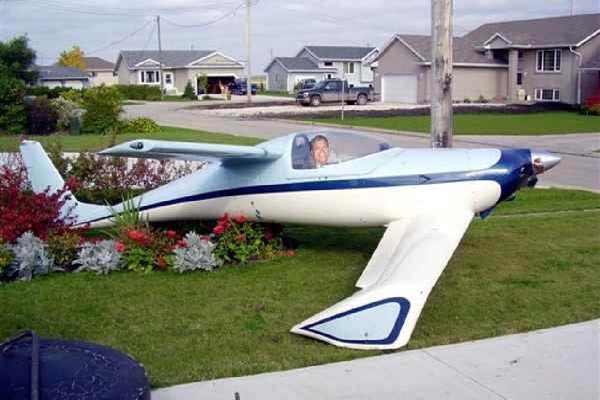 The airframe was built and much of the body work was done. 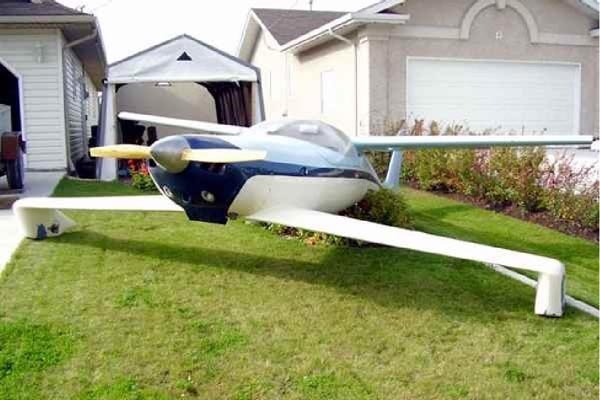 Still it needed a cowl, engine, panel, and all the other things to make it a flying airplane. I built and have been flying a Pulsar XP for about 10 years now. The Pulsar was powered by a 80 Hp. Rotax 912. I picked up a low time 115 hp Rotax 914 without the turbocharger (without the turbo it becomes an 80 hp 912) for the Q. I went through the whole engine to check and replace anything that wasn't like new. I replaced the 9 to 1 pistons for a custom machined set of 10.5 to 1 compression pistons ($650). There are no factory parts available to modify these engines. The high compression piston mod is a popular one among Rotax owners. It will take the 80hp model up to an honest 91 hp, with an almost unnoticeable increase in fuel burn. I have to say the 900 series engines have an excellent track record. I think the 912/914(s) are engineered perfectly for their purpose; lightweight and powerful with excellent reliability. 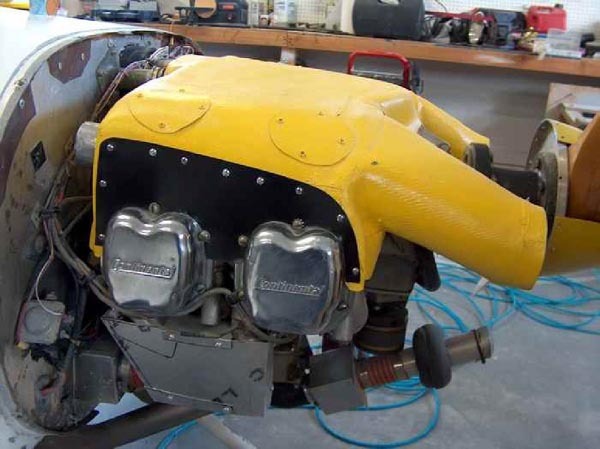 What other engine can beat the popular 912S 100 hp Rotax in weight, power, and reliability? Enough of the unsolicited sales pitch. This 91 hp engine was installed in the Pulsar to test after the rebuild. The Pulsar can land at a much slower speed than a Q-200 in case of an off field emergency. With the very noticeable power increase that is now available in the Pulsar, removing it and setting it aside for the Q seems unlikely at this time. There's more than 50 hrs. of "test time" on this engine including two trips to Oshkosh during the show ( I live 40 NM away) and the Q fly-in at Beatrice last year. What does 500 hrs. of work accomplish? Should be able to finish a whole kit in 500 hrs. right? Where did I read that? I started at the front and am working to the back. Finished custom engine mount and firewall forward items including longer and narrower cowl. Finished the Matco wheel and brake system with the Gall alignment. 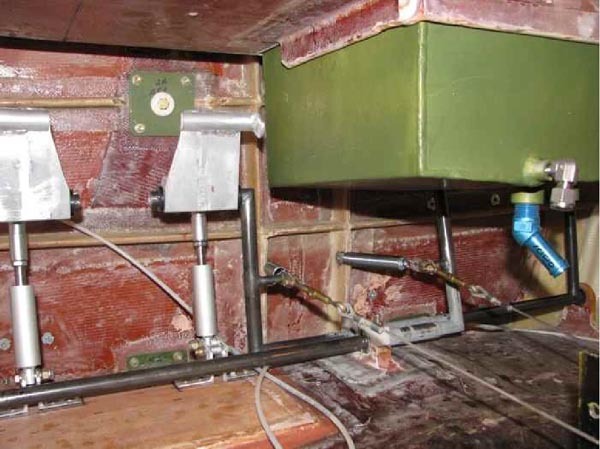 Made custom dual rudder pedals and pilot toe brakes (for toe brakes see issue 108, thanks Bob). Made and installed an aluminum header tank. Started working on the controls and installed the elevator torque tubes. 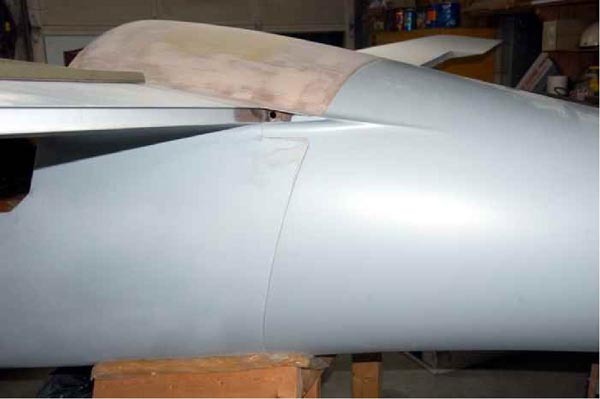 This year I hope to finish the controls and get a good start on the panel maybe get the airframe in primer. Honestly Doug, the highlight of my flying for 2008 was attending the hot air balloon festival in Albuquerque. My first balloon ride too. Great fun! My 2008 was highlighted by an airplane, that if never built, has enriched my life and clearly shown that the network of general aviation is still alive. The places, people and events that transpired from researching a unique 40 year old design have once again shown me that the sense of community others seek, we in aviation have! I moved to Ottawa, ON, Canada only a year ago and as fate would have it, I stumbled upon some old sport aviation magazines. When reading them over I saw the article on the "Quickie", however it provided little PRESENT day information on plans or construction methods. A short time later I treated myself to a visit at the National Aviation Museum and sure enough, they had a Quickie on display! The next day I found myself driving out to the airport. When I arrived, a hangar door was up & a Cessna 172 was undergoing "the annual". I met the owner and we started to talk planes. General hangar talk led him to ask me if I wanted to go flying. It was there, in that place between heaven and earth that I decided I had to get back to flying. I would find a way to build the Quickie. I went to the museum to study everything they had on composite and canard design. The curator even showed me the actual plans that were used to construct the Quickie that was on the museum's floor. At present, I continue to learn and gather equipment, supplies and skills to create my own vehicle for carving up the sky. This would be the 3rd aircraft I have built. The people I've been exposed to over the later part of 2008 has left me feeling positive and energetic. I'd like to thank all those I have met and who have shared their valuable time,knowledge and experience with me. Those of you who are still building, don't forget, as I almost did, others believe in what you dream, even if quietly sometimes. 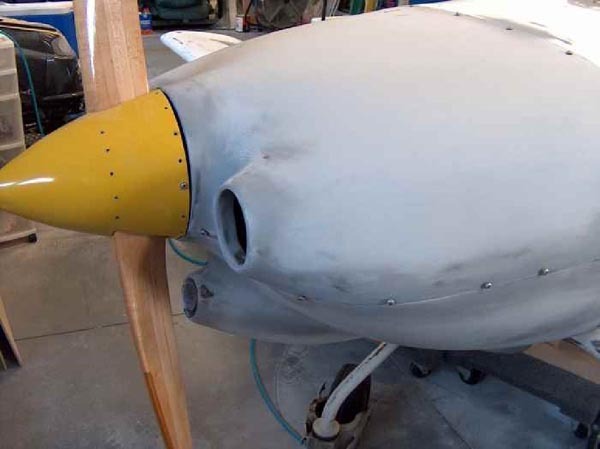 D. Michael Bergen sent me this photo of his rear fuselage joint and describes how he achieved this smooth fit. What I did is make a composite piano hinge using Nylon 11 tubing from McMaster-Carr and purchased some stainless steel wire as well. You make a length of the stuff by wrapping the nylon tubing with 7781 type glass cloth, pinching the glass tight to the tubing with a piece of aluminum angle cover with a release tape. After cured it is cut to 1/2 to 5/8 inch lengths and then bonded into the fuselage halves like a piano hinge. It turns out to be an incredible amount of work! Further, I found that despite best efforts to get everything right it is a lot of fit and finish to get the SS wire to push into the "hinge" a full half of the fuselage. I'm having to rework it a bit to do four pieces of wire. Selling due to age. Revmaster 65 HP engine. Never flown but is ready for taxi testing. Located in Aurora, IL. $10,000 OBO. 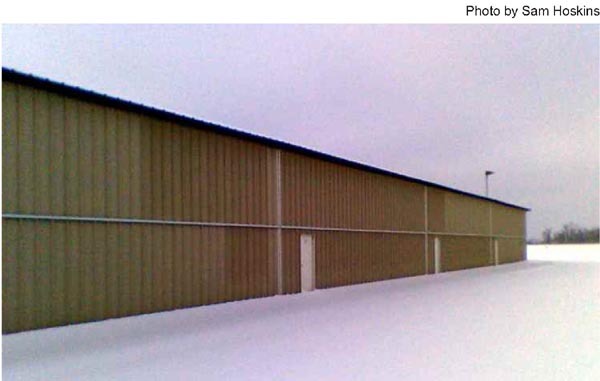 Call Gordon Hanson 630-545-2107. You can order a printed copy of Q-talk #133 by using the Q-talk Back Issue Order Page.